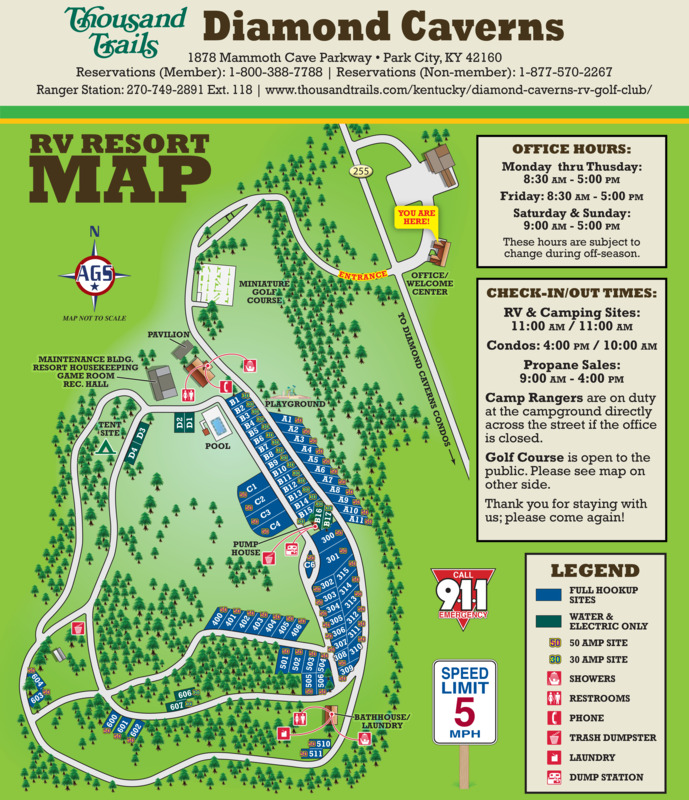 Ask fellow campers about "Goose Creek RV & Camping Resort" and nearby attractions. We stayed here on the 4th of July weekend. A very nice CG, but the grass was tall at our site. The camp site next to ours had to move their car so we could park the trailer. There were too many permanent camper set up. Our site was parked around near a dozen permanent sites. On the other hand the bath houses were clean and in good condition. The pool was great with a great slide. The staff was great too. We camped at Goose Creek RV & Camping Resort in a Travel Trailer. This campground is an Encore/Thousand Trails Park and consequently consists of primarily Park models and seasonal sites. The RV sites are just ok, especially for a smaller RV. Most of the sites weren't real level from front to back if you have a big rig. 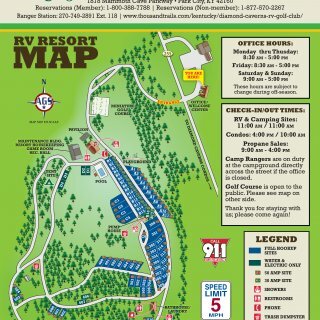 There is only one dumpster in the entire campground and it's not close to the RV sites. We camped at Goose Creek RV & Camping Resort in a Motorhome. As usual GCRvpk, was clean, friendly, full of activities. The $2 pinic was catered by a different company, so there was a little difference, with the amount of food (we all over eat, anyway). The food ws still very good. Dog friendly w/ dog enclosure pk. That price was the Memorial day weekend Thurs night with NO discount. (my fault) TT usual gets 20% off. so roughly for 4 nights w/s/e approx $ 235. I'LL BE BACK. We camped at Goose Creek RV & Camping Resort in a Travel Trailer. New store opened up Called LOWES right next to Lowe's home improvemnet store. This new LOWES is like a Whole Foods on steroids. FANTASTIC. Stayed 9 nights. Paved roads. Grass sites next to their ponds. Not many RVs in the "camping area" for transients during our stay. I'd guess 90% of the park is park models, double wides, and "seasonal RVs", many of whom use these as their "beach & fishing" getaways. Weekends were very busy with influx of seasonals and I'm guessing it's much worse during the summer months. The swimming pool was closed during our visit. Sites are very close and full sun. Big rig friendly. Most of our time was spent exploring, so this was an OK stay for us and would stay again, but not during peak season. We camped at Goose Creek RV & Camping Resort in a Fifth Wheel. Friendly staff, Gated with key access ($10 refundable deposit). It was early in the season so the pool and water slide were not open yet. It's a big park but it is mostly full timers. Some sites along the pond looked un level, on a slope. We had a very nice site along the water, next to the boat ramp. Beautiful view of Bogue Sound. Fires allowed but bring your own off ground fire pit. Cable worked fine. Good Cell service (we use Straight Talk). We camped at Goose Creek RV & Camping Resort in a Fifth Wheel. Mostly permanent residents; the park put services in a grassy area beside the pond but they forgot to level the grass before, during or after. We were put beside a drainage ditch when there were numerous other sites they could have assigned. We would not stay here again. We camped at Goose Creek RV & Camping Resort in a Motorhome. Stayed last year for the first time- love this place. This year we got a nice shaded spot, but during the day HEAVY with traffic (on a corner), spot G00. Lot had smoking butts, that's what stopped me from giving this rating a 9. As far as the events - Great. The pig pickin' for $2 is awesome, this year the military salute was very, very nice, and the night at the waterside was great. We even thought about purchasing something more permanent. We camped at Goose Creek RV & Camping Resort in a Travel Trailer. Take in the park's amenities. Go to Morehead City, Beaufort, Atlantic Beach, and Emerald Isle. great beaches, good shopping and great seafood-fresh.Oh do not forget the aquarium @ Pine Knolls. Some of the things that others didn't like didn't bother us. The staff was very friendly, the park was clean. Some have mentioned that the vast majority are permanent residents. This is true but all sites appear to be well kept, not a bunch of "junkers" as we have seen at other parks. ATT was good, easy satellite set-up. Sites were a little close and angled up in the back but we had no trouble leveling. I would have given this a little higher rating except for the wifi. The cost was $3.95/day. We have an external adapter which gives us excellent reception. We had a good signal but the wifi was VERY slow most of the time. We weren't streaming or skyping and it sometime took over a minute to load a site. 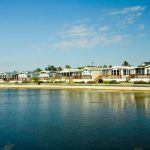 We would stay here again/ We camped at Goose Creek RV & Camping Resort in a Travel Trailer. For the cost I had to pay extra for wifi. Lots too close to each other!! Of course no one ever said anything about the airfield used for training jets, fuel tankers. God Bless Our Troops!! But to pay this amount of $$ and have to literally stop any conversation due to the noise from jets (you can see the pilots they are that low) and 10:30 at night one night, is unbelievable. I feel sorry for the annual people. I also understand why there are so many rvs for sale. We camped at Goose Creek RV & Camping Resort in a Travel Trailer. 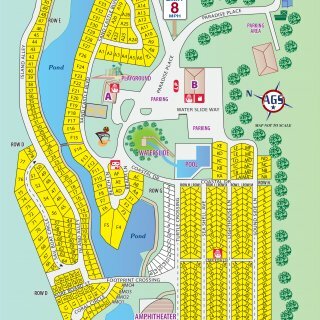 Very large mobile home / park model park with a dozen overnight sites. Paved road with grass sites, gated entry, club house, water slide and pool, snack bar and small store. Private boat launch and pier. Most non-permanent sites are back in, short, uphill and close together. Utility pedestal close to front of site and sewer outlet in back corner so difficult to empty mid-rig outlet going uphill. Had multiple low voltage occurrences. Only one trash location and only 5 washing machines for over 700 sites. Wi-Fi $4 per day and extra charge for cable TV. At this premium price I expect a premium park and site. They also add a $4 resort fee to published price. Even with Passport America discount on weekdays, we will not return. 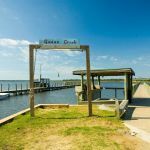 We camped at Goose Creek RV & Camping Resort in a Fifth Wheel. This is an Encore park that honors Passport America rates Sun- We camped at Goose Creek RV & Camping Resort in a Travel Trailer. Close to Emerald Isle. An Encore/TT park. Rate based on using our PA membership. Mostly seasonal sites with about 30 overnight. Verizon signal was good and we used our hot spot. Place does get busy on the weekends - kids, golf carts, etc.. However, noise never was a problem during our stay and the park basically goes quiet at dusk. Especially quiet on the weekdays. Pool with large waterslide. Security guard/gate at the entrance. Sites have full hookups, are back in, level and reasonably spaced. No trees between sites and we had good satellite access. Plenty of room for our 45' motorhome to maneuver - site and the roads. The park overall is well maintained and the staff were very friendly and accommodating. Will definitely use again when in the area. We camped at Goose Creek RV & Camping Resort in a Motorhome. Great fun over on Emerald Isle - typical beach town with no hotels. Large Lowes grocery store and several gas stations just a few miles west on Hwy 24. The rate is Passport America for Sun - Thur. For this price it is a good deal. The park is mostly sites owned by people for weekend seasonal use. There are maybe 20 for passers thru. A few on the sound water front where the boats launch and then some along a bank of grass down one road. Nice staff, good location to investigate the area of bring your boat. Crowded on the weekend but really quiet during the week. The pool is well monitored and has a great water slide that is addictive. Good facilities, cable etc. For the area it seems to be a good choice. We were on our way further up the outer banks so good stop for a few days, got up and hit the ferry over to Ocracoke - great location to get the ferry - about an 1 1/2 to drive in the morning, get on the ferry and go north. Really fun experience - no trauma with the large fifth wheel. Ferry takes longer than driving around but much less back road stress and nice to be on the water. Would stay again if in the area for sure. Great local seafood in the area, good grocery stores etc. We camped at Goose Creek RV & Camping Resort in a Fifth Wheel. We really enjoyed this campground and would have rated it higher if not for the weekend drunks. The rate reflects a PA discount for Sunday through Thursday. The sites are grass, fairly level with a picnic table but no shade and our site was located next to a concrete pond. We had FHUs with good power, water pressure and well located connections. They have WI-FI but it is Tengonet which means it was useless most of the time. The Verizon signal was a little weak but we were able to use our hotspot most of the time. The cable has many channels and the lack of shade would make getting a good satellite signal easy. The pool was closed while we were there but we heard it opens on Memorial Day. The resort is very quiet during the week but gets very noisy with loud music and loud voices on the weekend. The partying continued on the lower H row sites well past midnight and the other residents said this has been going on for a while. The office personnel were very friendly and told us about a few of the local attractions. We would probably stay here again if we could get a spot in a different location of the park. We camped at Goose Creek RV & Camping Resort in a Motorhome. We stayed in a back in site along the Bogue Sound instead of choosing a pond back in site. Most of the spaces are long term residents. Our site was grass, with park like setting all around us out to the inlet. We didn't have any WIFI available here. But the staff is extremely friendly and so are the long term residents. They have their own pier that provides a fish cleaning station. We stayed here in their off season so you talk about it being quiet and they still patrol the area. You are not far from Emerald Isle and this park is far nicer than the parks that are set on the Isle. We would come here again. We camped at Goose Creek RV & Camping Resort in a Motorhome. Are you affiliated with Goose Creek RV & Camping Resort ?